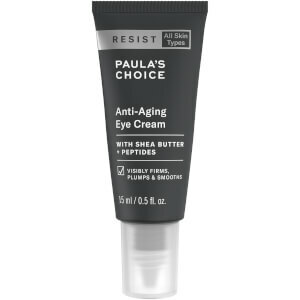 Resist Retinol Skin-Smoothing Body Treatment with antioxidants utilizes a specialized Retinol complex, potent antioxidants, and skin-repairing ingredients to intensively smooth and firm skin all over the body. This silky, concentrated lotion has a rich texture that goes to work immediately to repair dry skin as well as give it the essential ingredients it needs to be silky soft. Soothing emollients and plant oils provide lasting, non-greasy moisture. Provides an instant, healthy glow. Apply a thin layer all over the body as often as needed. Massage into skin using gentle circular motions. May be used over an AHA or BHA product; may be used with a skin-lightening product. For daytime, protect exposed body skin by pairing with a sunscreen rated SPF 15 or greater. Water, Cetearyl Alcohol, Cetearyl Ethylhexanoate, Cyclopentasiloxane, Dimethicone, Glycerin, Butylene Glycol, Cetyl Palmitate, Butyrospermum Parkii (Shea Butter), Glyceryl Stearate, PEG-100 Stearate, Oenothera Biennis (Evening Primrose) Oil, Vitis Vinifera (Grape Seed) Oil, Cetyl Alcohol, Retinol, Tetrahexyldecyl Ascorbate, Tocopheryl Acetate, Caprylic/Capric Triglyceride, Panthenol, Carnosine, Dimethiconol, Dimethicone/Vinyl Dimethicone Crosspolymer, Beeswax (Cera Alba),Magnesium Aluminum Silicate, Sodium Hydroxide, Xanthan Gum, Dicaprylyl Carbonate, Decylene Glycol, Disodium EDTA, Chlorphenesin, Phenoxyethanol. I have sun damage on my arms and chest area where I used to always be lax with putting on a daily sunscreen. Blotchy, reddish patches and a dryness that never seemed to go away. I saw real improvement in the tone and texture of my skin after using this for a few weeks. No, its not some miracle cure but it can lessen the look and feel of sun damaged skin. Goes on silky and smooth with very, very slight fragrance. Absorbs quickly. Never feels sticky. I would (and have) recommended this product to others.